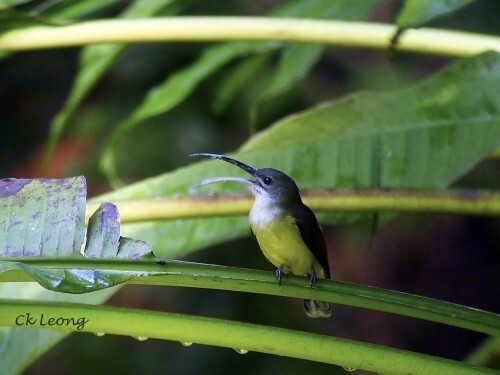 An uncommon bird of the lowlands, the Thick-billed Spiderhunter Arachnothera crassirostris is sometimes confused with the Little Spiderhunter A. longilostra which has whitish-grey throat. Both birds also have similar eye markings. If possible, it is always good to spend a bit of time checking out the eye-ring of the Yellow-eared Spiderhunter Arachnothera crysogenys. 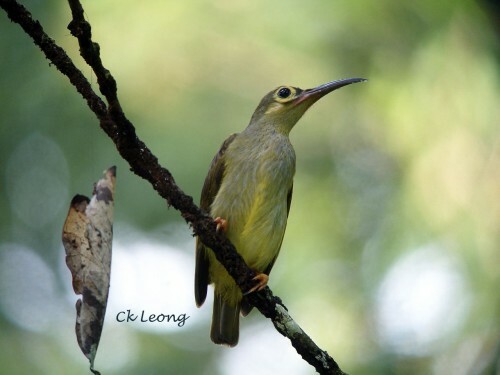 The similar looking Spectacled Spiderhunter has a full and broader eye-ring whereas the Yellow-eared has a thinner and incomplete eye-ring. In the field these spiderhunters defend their favourite fruit and flower bunches aggressively. 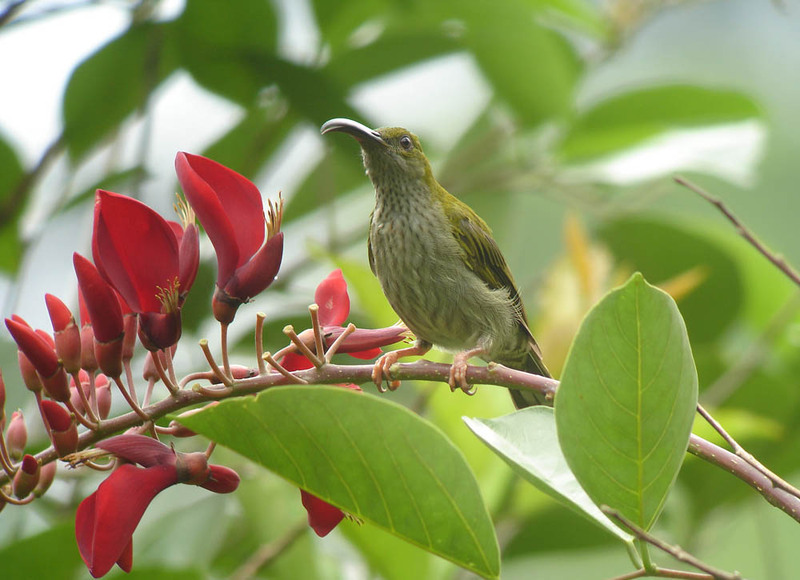 The Spectacled Spiderhunter Arachnothera flavigaster is a bit of a bully, ready to chase away other birds from any flowering tree it frequents. It also has a preference for the top level of trees. If you are hoping a get a photo of the bird as I did, it is better to find a low level flowering tree. Good luck. Let’s start MMXI with a common resident found throughout the lowlands. The Little Spiderhunter Arachnothera longirostra is also probably the easiest of the spiderhunters here to identify being the only one with a white throat. Usually you will see it zipping through the lower storey of the forest, stopping only to feed on the nectar of banana and ginger flowers. Special thanks to G.W.H. 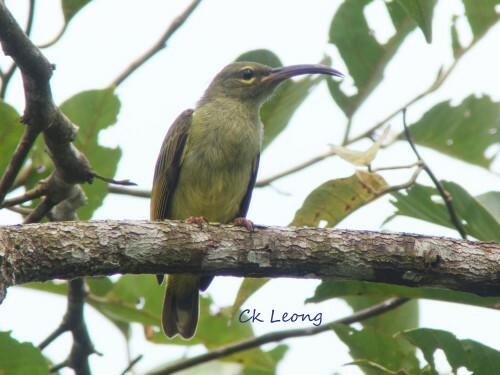 Davison (The Birds of Borneo, 4th Edition, 1999) for putting away this discussion of an endemic “Bornean spiderhunter”. What we do have is this Arachnothera affinis (race A. a. everetti in Borneo) with heavy streaks extending from the chin to lower abdomen. 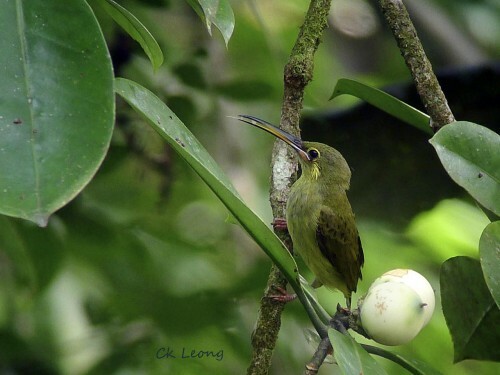 You can find this bird easily around Poring Hotsprings, Danum Valley and the Rafflesia Forest Reserve. While on the field, care must be taken not to mistaken the Grey-breasted Spiderhunter (less heavy streaks, on upper breast) with this bird.